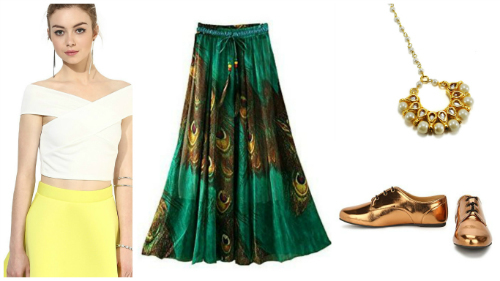 7 Indo-Western Looks You Haven’t Tried… But Totally Should! Diwali is that time of the year which brings a smile to our faces. The lights all around us are uplifting and help elevate our moods. Then why let limited festive shopping budgets ruin the mood? Flaunt the prettiest outfits and flood your social media with amazing pictures because we’ve been creating a list of under Rs.1000 pieces that are sure to light up your Diwali wardrobe. What’s more? 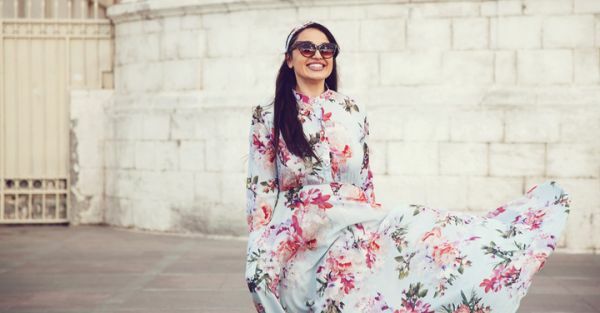 This special list of apparel and accessories has been carefully curated from Amazon Fashion’s India Modern Festive Collection which was also the theme of the Amazon India Fashion Week. These gorgeous looks put a new spin on fusion wear and are sure to make heads turn this Diwali. 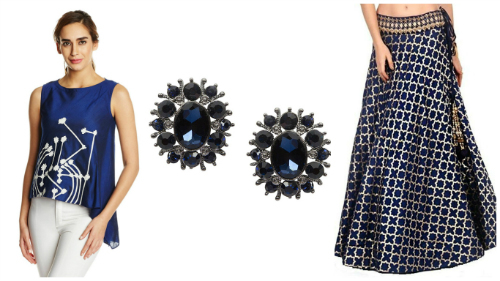 If blue is your favourite colour then this look is the perfect pick for you. Blend Indian and western wear with a hint of glamour in this pretty, printed high-low blue top which can be teamed with this blue and golden printed skirt. Accessorise with a pair of blue, star-shaped studs to add a little chutzpah to your outfit. A little bit of sparkle never hurt anyone, right? This look is a blend of tradition and comfort. Salwars or dhotis are roomy and work well when you don’t have the time to change your outfit the entire day. Pair this pink salwar with a golden crop top to slay the Indo-western look. Throw on a pair of golden slip-ons to ooze glamour. Don't forget to carry a pretty golden clutch to match your top and slippers. These outfits are curated from Amazon Fashion’s India Modern Festive to celebrate the festive season with all your favourite brands. This outfit is perfect for those who don’t like too much colour and prefer to stick to black. Flaunt your midriff in this black tube top and pair it with these black high-waist palazzo pants to keep you looking stylish all night long. 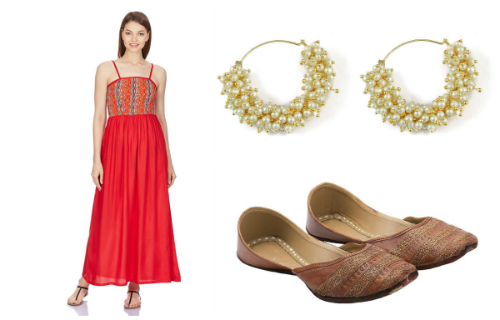 Add height with a pair of red sandals to match with your red pout. 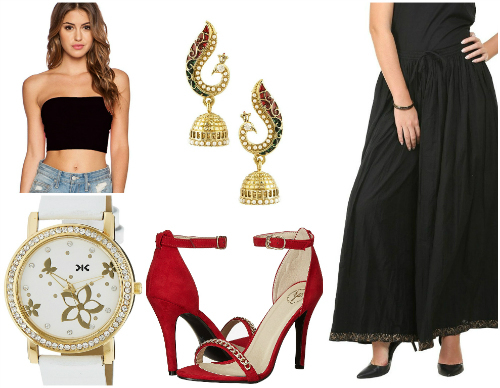 Traditional jhumkas add the desi touch this look needs. Keep time with this studded white watch. This outfit can light up any function - whether it's in the day or at night. 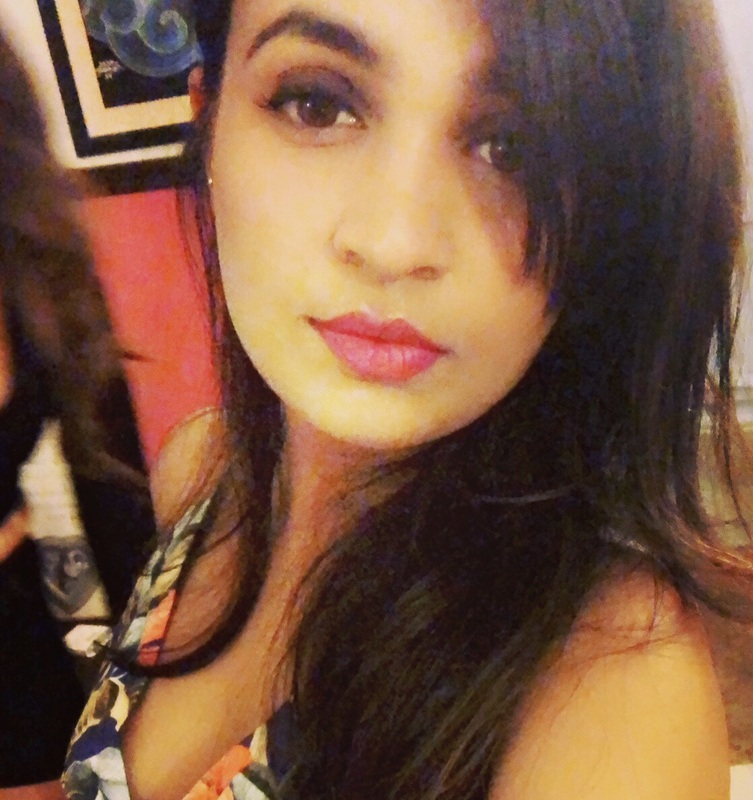 Are you the tomboy of the group and minimal dressing up with no makeup is your thing? You’ve come to the right place! This denim and kurta look does not require too much effort and is easy to execute. Pick distressed denims to go over a plain white kurta. 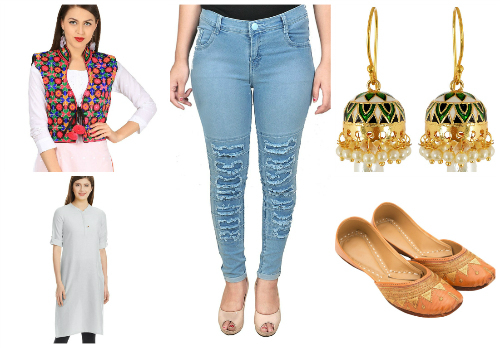 Throw on a pair of pearl jhumkas and traditional mojris for an effortless look this Diwali. This colourful half-jacket adds a lot of colour to your outfit. You can even wear this look to college because it's that effortless! Diwali evening night out with your best friend and your crush is going to be a part of the function too? We bet he will fall in love with you the moment he sees you in this orange dress - a comfy option for any function and perfect to accentuate a tiny waist. Team this with pearl loop earrings and beige mojri. 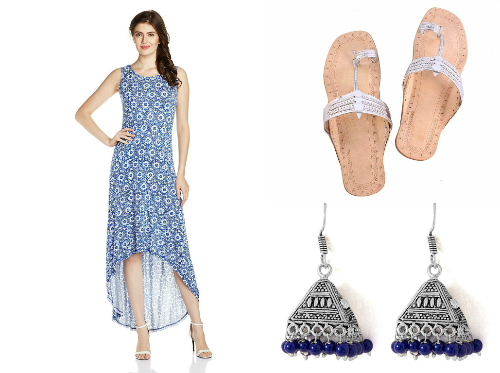 Keep it simple with this high-low blue and white dress - an airy, comfy option for a muggy evening filled with revelry. These silver kohlapuris are as comfortable and don’t give you sore heels or toes at the end of the day. These silver earrings add a rustic touch to your entire outfit. Wear a silver bindi to complete your look and bright red lipstick to contrast all the blue. This is one of our favourite looks and is great for when you don’t want to wear too much makeup; the outfit does the job. Pair this pretty peacock printed skirt with a white crop top for a brilliant fusion of east and west. We can’t stop lusting after these vintage gold brogues and we’re adding a chutzpah with this statement maangtika. *This is a sponsored post for Amazon Fashion. Shop from their India Modern Festive collection here.